I’ve aptly dubbed this dish the Meataterian Nightmare because it has many of the dreaded veggies that carnivores can’t stand. I modified the original recipe derived from the vegetarian cookbook 1,000 Vegetarian Recipes by Carol Gelles. In it was a one titled Winter Vegetables for a Crowd. 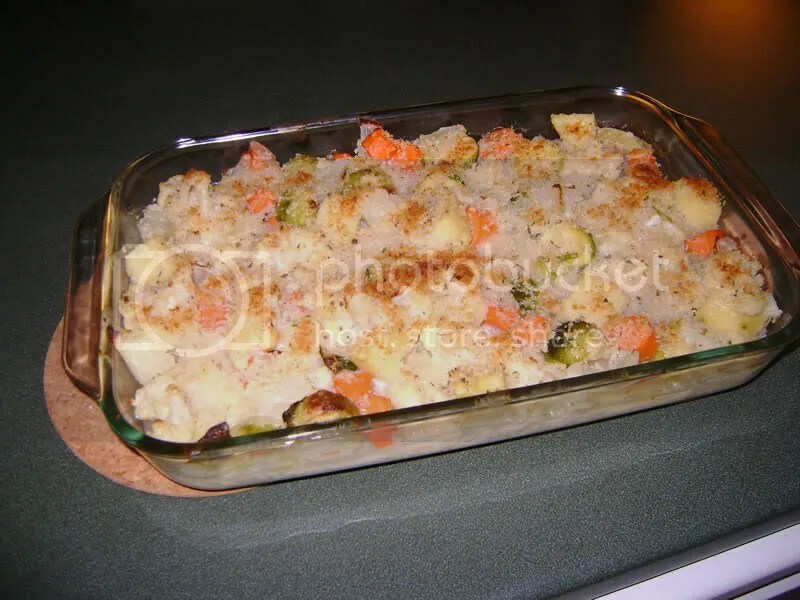 It’s basically a compilation of hearty vegetables smothered in a cheese sauce and baked off in an oven. Simple and easy. 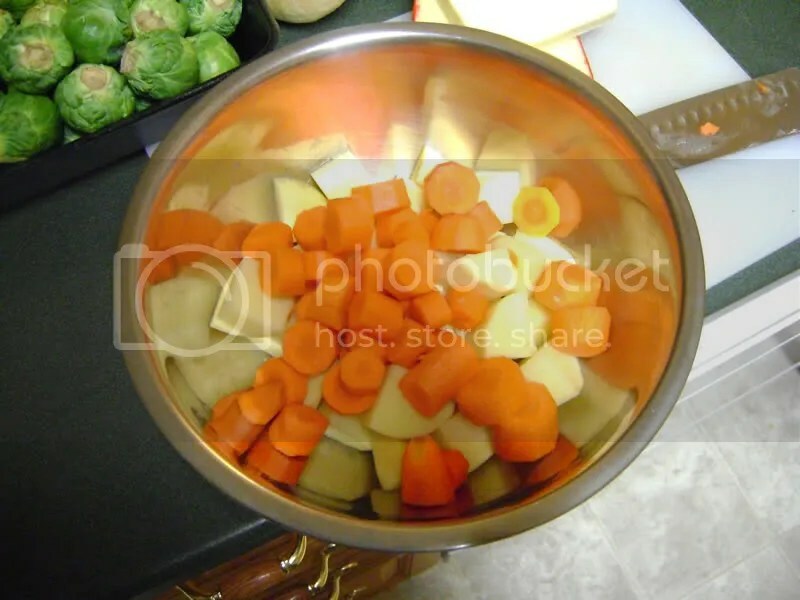 Since we’re in the north now I figured it was a good choice as a side dish for Christmas dinner. 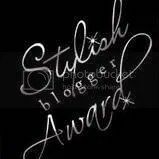 Having made it once already I added a few twists to suit my personal taste. 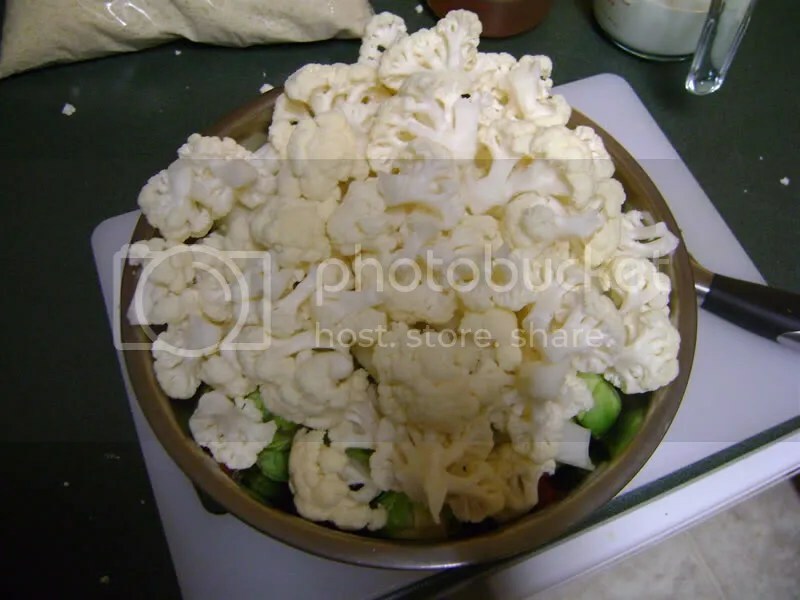 This recipe is cool because you can throw virtually any vegetable in there that you like. 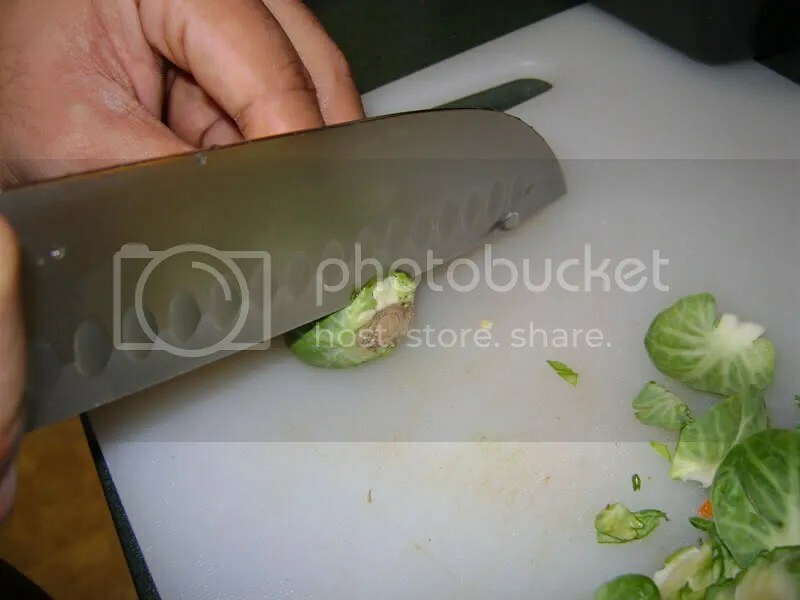 Note: When cutting up the Brussels sprouts remember to cut off the rather tough end of the stalk. It’ll be easier to cook in the end plus you get rid of the first couple of layers of leaves that tend to be a little on the unsavory side in both taste and appearance. 2. 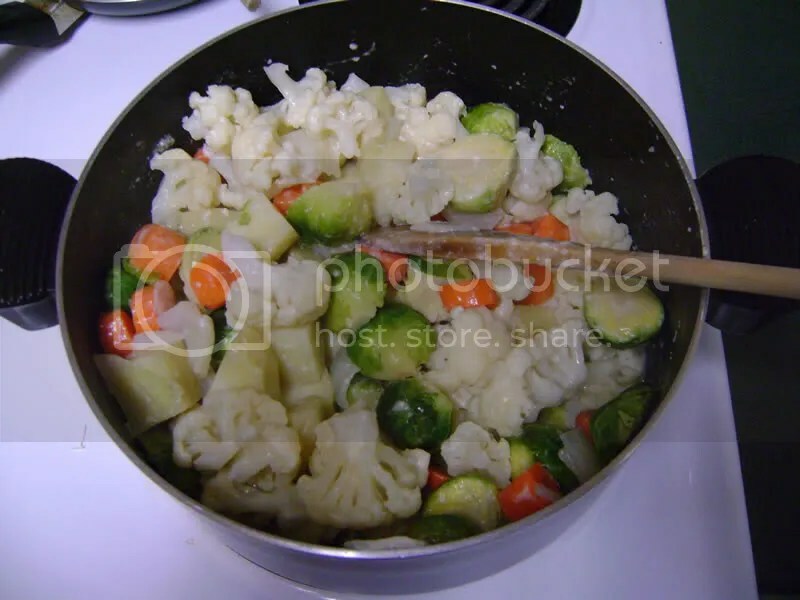 Cook Brussels sprouts, potatoes, cauliflower, carrots and onions in boiling water until tender – about 10 minutes. 3. 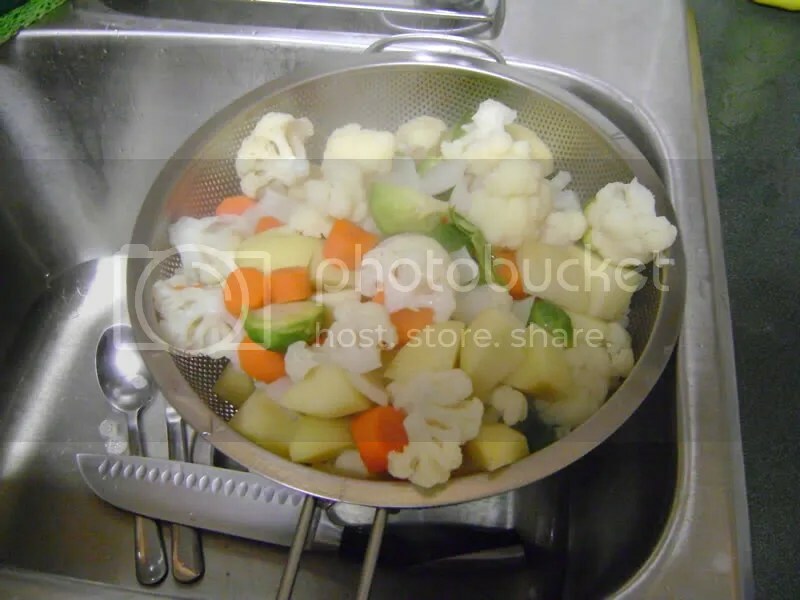 Drain vegetables in a colander and pat dry excess water with a paper towel. Note: This is very crucial in getting this dish right. 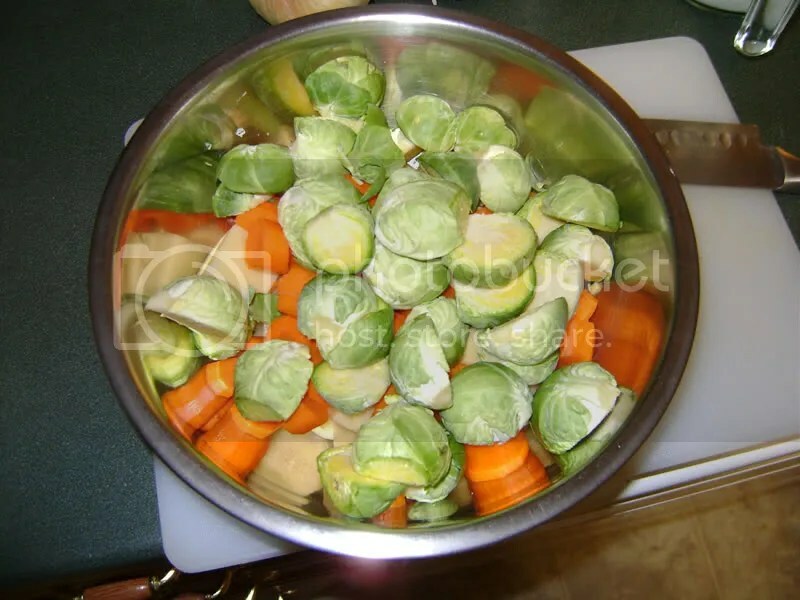 The sprouts and cauliflower retain a lot of water even when left to drip dry so it is essential that you try to get rid of as much water as possible lest you be left with a runny dish in the end. 4. 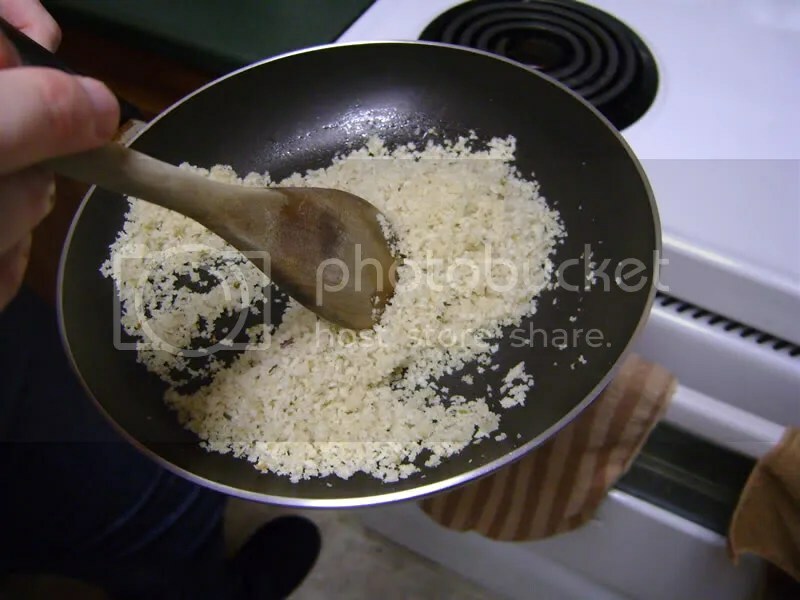 In a small saucepan, melt 3 tablespoons of the butter or margarine over medium high heat. Stir in flour till absorbed. 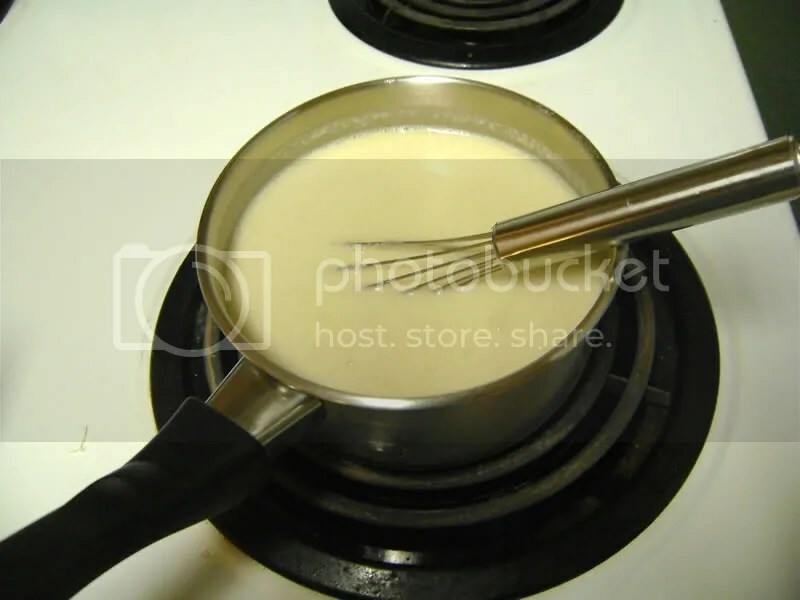 Stir in milk and broth; bring to a boil stirring constantly. Stir in Gouda. 5. 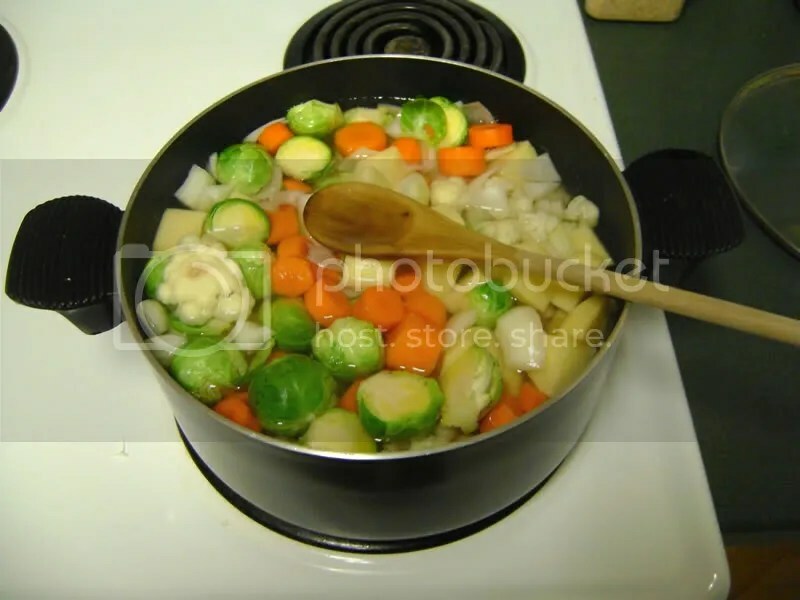 Mix vegetables and sauce together with a wooden spoon. 6. 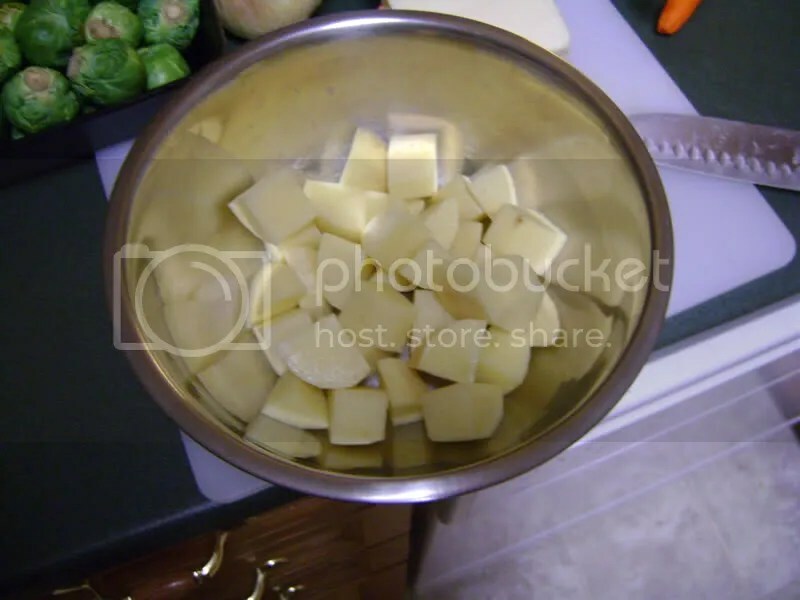 In a small saucepan, melt remaining butter or margarine over medium heat. Remove from heat; add the bread crumbs and oregano and stir until the butter or margarine is absorbed. 7. 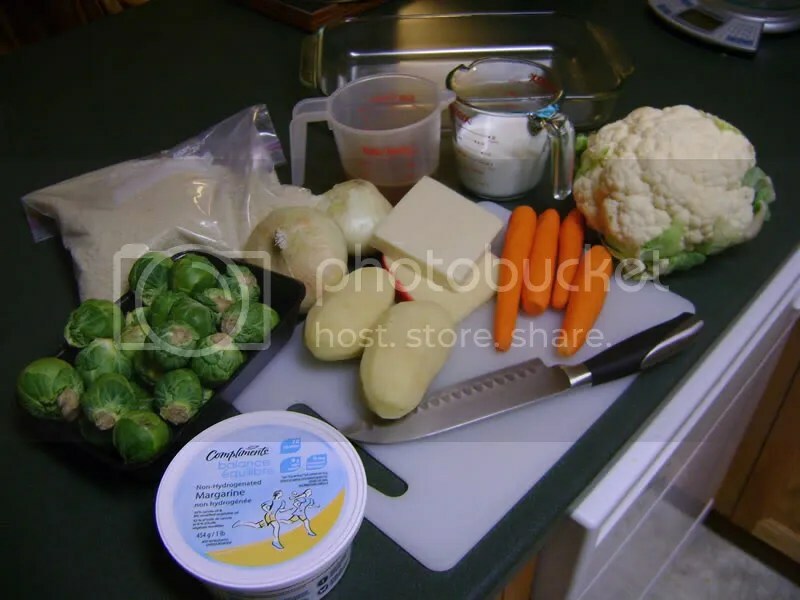 Pour creamed vegetables into a large 3 quart casserole dish. Sprinkle mixture over them evenly. Bake for 30 minutes (uncovered) or until topping is browned. Alternate: Substitute a Cheddar / Mozzarella mix or Swiss instead of Gouda. This entry was posted on January 13, 2011 by Ian the Zen Assassin. 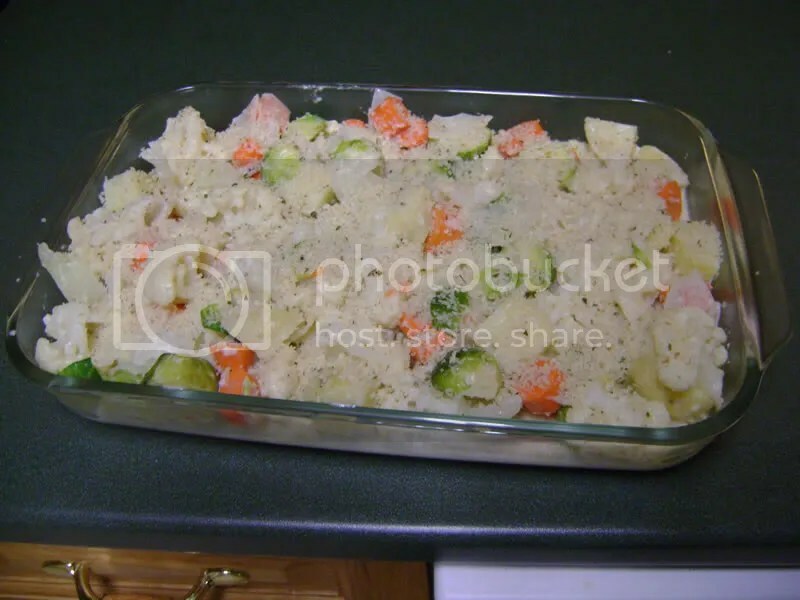 It was filed under Recipes and was tagged with 1000 vegetarian recipes, brussels sprouts, carol gelles, carrots, cauliflower, cheddar, cheese, easy meal, food, gouda, meataterian nightmare, milk, mozzarella, onions, potatoes, quick meal, side dish, swiss, vegetable broth, vegetarian, winter vegetables for a crowd, yukon gold. Mmmm…cheese sauce. I don’t like Brussel Sprouts, but I’ll try anything in cheese. 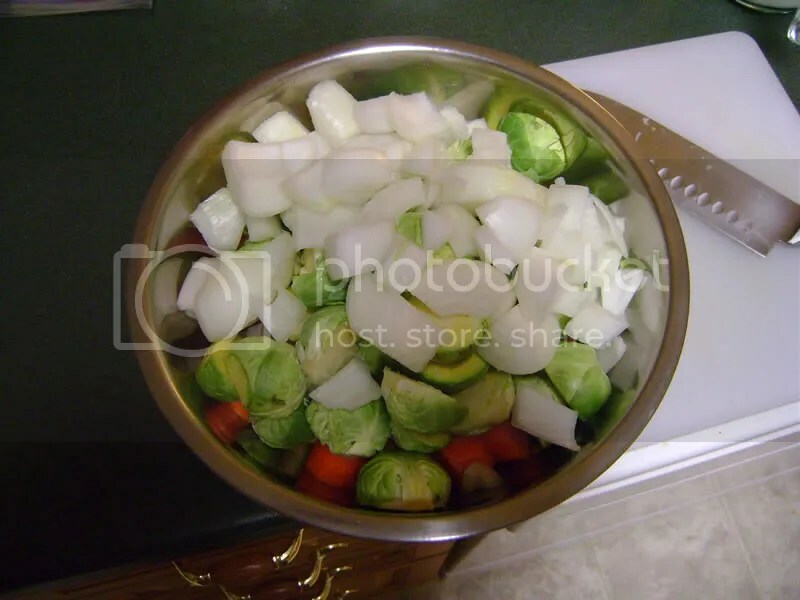 Sub out the sprouts with like broccoli or turnips. Different veggie, same cheesy goodness. 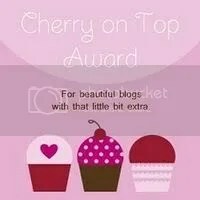 Honestly, just as I was clicking on your link, I was thinking, “I hope he has a new recipe posted.” And voila! The pictures are amazing. Three day weekend here…I’m ready! This sounds as good as Suzanne’s cheesecake, Ian…I’d have to use Swiss, being lactose-intolerant. I love Brussels sprouts! Me too. Suzanne isn’t the biggest fan of them but when I make them right she loves them as well.